Greetings one and all! It is my distinct honor and privilege to post my first article on the Senior Home Care Blog. I am thrilled by the invitation to post regularly. In subsequent reflections, I will share stories and insights derived from my personal and professional experiences as a caregiver. Fundamentally, I am by nature, nurture, and necessity a caregiver. And since you are reading this blog, I think I am safe to assume you have an interest in caregiving as well. Consequently, this is the common ground on which we stand. The basis for future conversations. My passion for providing beneficial information to caregivers and care receivers is rooted in the defining moments of my life. When I was 15 years old, my life changed forever. My mom was diagnosed with terminal breast cancer. Over the next 8 years, I served as one of her primary caregivers—experiencing the blessings and the burdens of that daunting journey. A decade later, I shared in the care of my dad who suffered a stroke and ultimately died of terminal cancer. I also companioned my godmother who developed vascular dementia in the final years of her life. Each time I was called to care, I felt ill-prepared and ill-informed. Reactive instead of proactive. Everything seemed beyond my control despite my best efforts and intentions. Sound familiar? In the years following my personal experiences as a caregiver, my professional life unfolded in amazing and unexpected ways. I never in my wildest dreams imagined working with families challenged by terminal illness. That was a story I did not choose to revisit. However, as it ends up, that is exactly what I needed to do. It is what I am called to do. As you will learn in future postings, I worked in hospice and palliative care for many years, serving as a chaplain and community educator for a hospice in Denver, Colorado. Today, I serve as an educational consultant. I speak and write about the issues related to aging, illness, and end-of-life care. My initial experiences as a caregiver inform every program I present and every article I write. As a professional in the field, I am well versed in theories, models, research, and foundational teachings relevant to caregiving. However, knowing the experience of caregiving from the inside out is my impetus to serve caregivers and care receivers. My goal in writing is simple yet substantial. By sharing stories, I hope to educate, enlighten, and inspire you. I am a firm believer that knowledge is power. 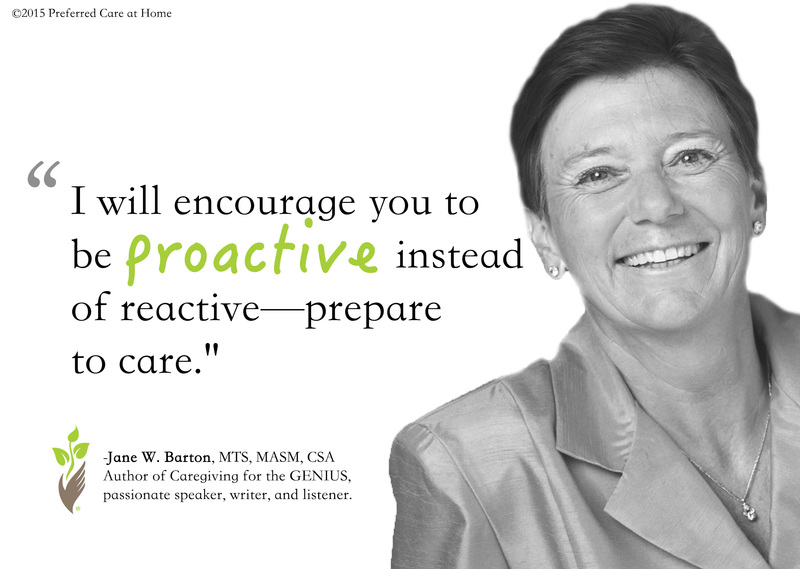 I will encourage you to be proactive instead of reactive—prepare to care. Gather the needed information to make informed decisions and develop an initial plan of care. I will enlighten you about the challenges as well as the opportunities afforded by giving and receiving care. And, I will inspire you to engage the journey of caregiving in life-giving, innovative ways. Are you a family caregiver looking for more resources to equip you? Visit Preferred Care at Home’s Family Learning Center for free online modules and subscribe to the Senior Home Care Blog to stay up to date on Jane’s posts.